Posted: Mar. 25, 2011 | 2:06 a.m.
A Las Vegas police detective wants members of the public to pursue criminal charges if they suspect they have been victimized by their attorneys. “They think their only recourse is to file complaints with the Nevada State Bar,” Detective James Downing said. ……. Yeah. Vegas, baby! Great Lakes Airlines is scrapping its daily Denver flight and replacing it with a midday turnaround flight to Las Vegas McCarran International Airport. That change is scheduled to begin May 15, Mike Coster, Yelland Field Airport manager, told the White Pine County Board of County Commissioners. I’m not entirely sure what to make of this article, except perhaps that it’s good the “mainstream media” has acknowledged other voices (and witnesses) weighing in someplace, and is picking up that the Nevada activists are calling for a federal investigation. The rest of the story is kind of pointless – they don’t even report what the letters from prisoners have been saying – in fact the reporter seems to almost justify Redman’s demise. Redman’s crimes should be irrelevant to the way he was reportedly tormented in his final hours: we have minimal standards of humanity by which we treat even the worst among us, or else we become too quickly like them. But his history there explains why the guards would be so contemptuous of him – making the version of his death told by prisoners even more credible. Clearly there are a lot of folks in the Ely area who disagree with that notion and think Redman got what was coming to him; I guess they’d have to in order to fully embrace the prison culture that so clearly degrades them. Sounds like everyone with a badge and uniform in Ely has already been acquitted, and the “investigation” is hardly even underway. The feds should be in on this one – no sign so far. Guess they have too many migrants to round up. Prison reform groups are calling for a federal investigation in the aftermath of a former Ripley man’s suicide in his death row cell at a Nevada prison. Timothy L. Redmen (AKA Timothy Lee Redman), 45, hanged himself with his shoelaces in his cell at Ely State Prison on November 18 to culminate a standoff with guards. Reports allege Redmen had barricaded and jammed his cell door preventing its opening and brandished a “shank (a homemade weapon composed of a sharpened metal rod with a bedsheet handle)” in an altercation with guards. 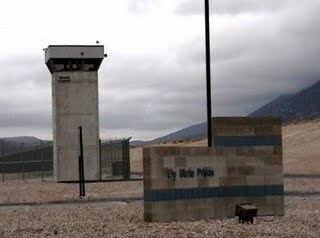 However, additional reports published online by prison reform groups on web-sites like Prison Abolitionist, Make the Walls Transparent, Nevada Prison Watch and Nevada Prison Voice claim information received from fellow inmates at the maximum security prison at Ely, Nevada, alleging that prison guards emptied several canisters of chemical mace into Redmen’s cell over a two-hour period of “torture” prior to him taking his own life and further allege they did nothing to prevent his suicide. In the aftermath, the cell door had to be removed by maintenance workers for a cororner to get to Redmen and for his body to be removed from the cell. An autopsy was ordered performed and an investigation initiated. A three-judge panel sentenced Redman to death in 1990 for the brutal murder of former West Virginian Max Biederman, then of North Carolina. Biederman was vacationing in Las Vegas when his path fatally crossed that of Redman. Biederman was shot by Redman near a low budget motel. Redman was preparing to flee the scene when he discovered Biederman still alive. He then fired more bullets into his victim, mutilated his face, pried out teeth and cut off his hands. Investigators believed Redman brutalizing the corpse was an attempt to conseal the identity of his victim. Biederman’s severed hands were later found along a highway to Idaho where Redman and a junvenile female companion were pulled over for speeding in Biederman’s stolen motor home. Redman was arraigned on charges of first degree murder, robbery and a use of a deadly weapon enhancement in Clark County, Nevada, District Court on March 21, 1990. He was convicted of all charges on November 28, 1990 after a jury tial, A three-judge panel sentenced Redman to death by lethal injection for the murder and added two, 15-year prison terms—one each for for robbery and for the use of a deadly weapon enhancement. Former Jackson County Deputy Sheriff Paul Clark remembers Redman all too well. Clark was a Jackson County Jail corrections officer and deputy when he was assaulted and beaten by Redman and two other jail inmates during an escape from the courthouse lockup. Redman was in jail for breaking and entering at the time of the escape. Clark was moving the prisoners from one side of the jail to the other when the trio jumped him. Clark said Redman had a knife he had made from a Bic pen and a razor blade from a disposable razor. After beating him, the inmates dragged Clark into a small air conditioning room, took his keys and escaped. Redman was the last of three to be recaptured. He was returned to the jail three days after the escape by a family member. Clark was one of the Jackson County witnesses who testified about Redman’s violent past at his murder trial and again at his sentencing hearing. Redman had a considerable list of criminal activity in Jackson County aside from his jail break. He was charged with assault and/or battery and carrying or concealing a dangerous weapon on four occasions. Redman’s direct appeal of his death sentence was denied by the Nevada Supreme Court in March, 1992. A subsequent federal appeal was denied in in October, 1992. Since then, Redman was charged with beating two prison guards with a deadly weapon in March, 1993. He was tried, convicted of two counts of battery by a prisoner with a deadly weapon and sentenced to two more consecutive 20-year prison terms. Subsequent appeals of his convictions and death sentence were denied—the last one by the Nevada Supreme Court this summer. In 1996, Congress passed a law that made it much harder for inmates to challenge abusive treatment. It has contributed significantly to the bad conditions — including the desperate overcrowding — that prevail today. The law must be fixed. In the name of clamping down on frivolous lawsuits, the Prison Reform Litigation Act barred prisoners from suing prisons and jails unless they could show that they had suffered a physical injury. Prison officials have used this requirement to block lawsuits challenging all sorts of horrific conditions, including sexual abuse. The law also requires inmates to present their claims to prison officials before filing a suit. The prisons set the rules for those grievance procedures, notes Stephen Bright, the president of the Southern Center for Human Rights, and they have an incentive to make the rules as complicated as possible, so prisoners will not be able to sue. “That has become the main purpose of many grievance systems,” Mr. Bright told Congress last year. In the last Congress, Representative Robert Scott, Democrat of Virginia, sponsored the Prison Abuse Remedies Act. It would have eliminated the physical injury requirement and made it harder for prison officials to get suits dismissed for failure to exhaust grievance procedures. It would have exempted juveniles, who are especially vulnerable to abuse, from the law’s restrictions. The bill’s supporters need to try again this year. Conditions in the nation’s overcrowded prisons are becoming increasingly dangerous; recently, there have been major riots in California and Kentucky. Prisoner lawsuits are a way of reining in the worst abuses, which contribute to prison riots and other violence. The main reason to pass the new law, though, is human decency. The only way to ensure that inmates are not mistreated is to guarantee them a fair opportunity to bring their legitimate complaints to court.